(Rick Egan | The Salt Lake Tribune) Richard Smith, drags some of his belongings, to keep them safe from the clean up crews, as the Salt Lake Health Department, Salt Lake City Police and other partners conduct a camp cleanup in the area near Victory Road in Salt Lake. Smith has been camping in this area for 9 years. Thursday, June 14, 2018. (Rick Egan | The Salt Lake Tribune) Jorge Mendez, Salt Lake County Health Department, assists Richard Smith with his belongings as the Health Department, Salt Lake City Police and other partners conduct a camp cleanup, Thursday, June 14, 2018. (Rick Egan | The Salt Lake Tribune) The Salt Lake Health Department, Salt Lake City Police and other partners conduct a camp cleanup in the hills east of Victory Road in Salt Lake. Thursday, June 14, 2018. (Rick Egan | The Salt Lake Tribune) The Salt Lake Health Department, Salt Lake City Police and other partners conduct a camp cleanup in the hills east of Victory Road in Salt Lake. Thursday, June 14, 2018. (Rick Egan | The Salt Lake Tribune) The Salt Lake Health Department, Salt Lake City Police and other partners conduct a camp cleanup in the hills east of Victory Road in Salt Lake. Thursday, June 14, 2018. (Rick Egan | The Salt Lake Tribune) The Salt Lake Health Department, Salt Lake City Police and other partners conduct a camp cleanup in the hills east of Victory Road in Salt Lake. Thursday, June 14, 2018. (Rick Egan | The Salt Lake Tribune) The Salt Lake Health Department, Salt Lake City Police and other partners conduct a camp cleanup in the hills east of Victory Road in Salt Lake. Thursday, June 14, 2018. (Rick Egan | The Salt Lake Tribune) The Salt Lake Health Department, Salt Lake City Police and other partners conduct a camp cleanup in the hills east of Victory Road in Salt Lake. Thursday, June 14, 2018. (Rick Egan | The Salt Lake Tribune) The Salt Lake Health Department, Salt Lake City Police and other partners conduct a camp cleanup in the hills east of Victory Road in Salt Lake. Thursday, June 14, 2018. (Rick Egan | The Salt Lake Tribune) The Salt Lake Health Department, Salt Lake City Police and other partners conduct a camp cleanup in the hills east of Victory Road in Salt Lake. Thursday, June 14, 2018. (Rick Egan | The Salt Lake Tribune) Jorge Mendez, Salt Lake County Health Department, talks to Richard Smith, as the Health Department, Salt Lake City Police and other partners conduct a camp cleanup, Thursday, June 14, 2018. (Rick Egan | The Salt Lake Tribune) The Salt Lake Health Department, Salt Lake City Police and other partners conduct a camp cleanup in the hills east of Victory Road in Salt Lake. Thursday, June 14, 2018. (Rick Egan | The Salt Lake Tribune) Richard Smith, gathers up some of his belongings as the Salt Lake City Health Department, Salt Lake City Police and other partners conduct a camp cleanup in the area near Victory Road in Salt Lake. Smith has been camping in this area for 9 years. Thursday, June 14, 2018. (Rick Egan | The Salt Lake Tribune) Richard Smith, drags some of his belongings, to keep them safe from the clean up crews, as the Salt Lake Health Department, Salt Lake City Police and other partners conduct a camp cleanup in the area near Victory Road in Salt Lake. Smith has been camping in this area for 9 years. Thursday, June 14, 2018. (Rick Egan | The Salt Lake Tribune) Jorge Mendez, Salt Lake County Health Department, talks Richard Smith after getting him a bottle of water, as the Health Department, Salt Lake City Police and other partners conduct a camp cleanup, Thursday, June 14, 2018. (Rick Egan | The Salt Lake Tribune) Richard Smith, gathers up some of his belongings as the Salt Lake City Health Department, Salt Lake City Police and other partners conduct a camp cleanup in the area near Victory Road in Salt Lake. Smith has been camping in this area for 9 years. Thursday, June 14, 2018. (Rick Egan | The Salt Lake Tribune) Heavy machinery is used to haul away tents, blankets and other things left behind as the Salt Lake City Health Department, Salt Lake City Police and other partners conduct a camp cleanup in the area near Victory Road in Salt Lake. Thursday, June 14, 2018. (Rick Egan | The Salt Lake Tribune) The Salt Lake Health Department, Salt Lake City Police and other partners conduct a camp cleanup in the hills east of Victory Road in Salt Lake. Thursday, June 14, 2018. (Rick Egan | The Salt Lake Tribune) Joe Patch brings his belongings done form the hills above Victory road, as the Salt Lake Health Department, Salt Lake City Police and other partners conduct a camp cleanup near Victory Road in Salt Lake. Thursday, June 14, 2018. (Rick Egan | The Salt Lake Tribune) Richard Smith, gathers up some of his belongings as the Salt Lake City Health Department, Salt Lake City Police and other partners conduct a camp cleanup in the area near Victory Road in Salt Lake. Smith has been camping in this area for 9 years. Thursday, June 14, 2018. (Rick Egan | The Salt Lake Tribune) Salt Lake City Police Chief Mike Brown talks to Richard Smith who is homeless, and has been living in the hills above Victory road for 9 years, as the Salt Lake Health Department, Salt Lake City Police and other partners conduct a camp cleanup in the area near Victory Road in Salt Lake. Thursday, June 14, 2018. It’s 9 a.m., it’s already nearly 90 degrees on the steep hillside below Ensign Peak in Salt Lake City, and pieces of trash are rolling down the mountain. They’re being tossed by members of a jail inmate work crew that just found what one inmate calls the “Taj Mahal” of homeless camps. There’s a fireplace with a grill and ventilation system that would send smoke into the air and away from a tent that appears to have been in place for years. The resident — who was gone by the time cleanup crews arrived — dug a system of hallways that led to the sleeping area, fireplace and bathroom. A cat litter box with the top cut off was used as a toilet. The makeshift dugout also includes shelving. Everything is covered by a collection of tarps, brush and sticks. The cleanup taking place off Victory Road near the oil refineries on the city’s northern edge Thursday morning will clear out refuse that’s built up over months or even years as people were displaced from their homes with nowhere to go and began living outside, or did so by choice. Crews from the Salt Lake County Health Department, the city and the Utah Department of Transportation spent much of the day clearing out the camps they found and piling up the refuse at the gravel base of the hill. A man drives a John Deere loader, scooping up piles of the belongings and dropping them into city and state dump trucks. There are bikes and bike parts. There are propane tanks. One resident erected a gas-fueled lamp post at his site. Worn clothing is scattered across the dirt at each campsite, and there are several sites along the zigzagging network of trails that climb the hill at the area, known as Hell Canyon. Crews also find a wakeboard, a motorized scooter, shopping carts and a recliner chair. Over a gravel berm on the north side of the area within view of passers-by on Victory Road, there are dozens of orange needle caps. There’s a collection of needles and a glass pipe. 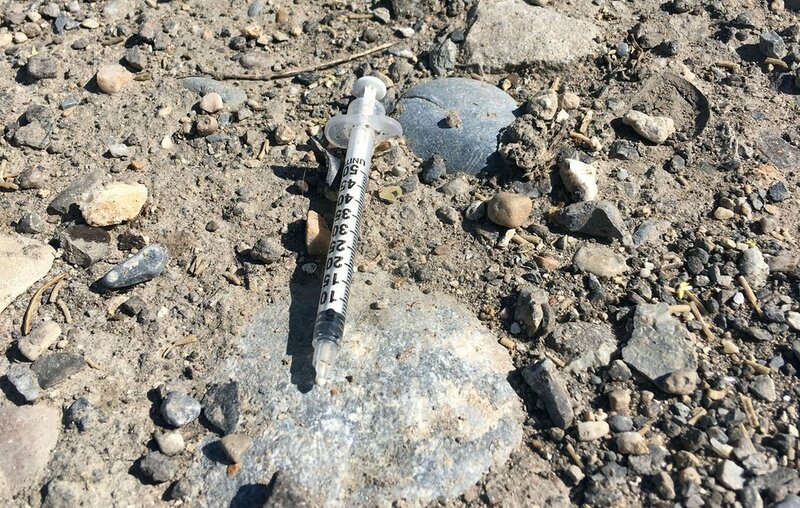 (Taylor W. Anderson | The Salt Lake Tribune) A used needle sits on the gravel near a collection of campsites near Hell Canyon in Salt Lake City on June 14, 2018. A group of public employees and county inmates worked to clear years of debris from the hillsides where over a dozen people were living. The people living here were given a two-week notice to gather their essentials and move on. City ordinance and county health regulations prohibit camping outside designated zones. Those still here are either packing up or watching from the roadside, thinking about their next move. Richard “Mountain” Smith, 50, said he’d lived in his camp on the mountainside for nine years and only knew where he wouldn’t be going Thursday: the emergency shelter downtown, about two miles south of his rag pile. While cleaning his water bottle and spoon and collecting his life essentials, Smith said he’d avoid the shelter, where he feared “thieving” by other tenants. He isn’t the only one. Either out of a preference for the rough life spent entirely outdoors or of fear of conditions at The Road Home emergency shelter at Rio Grande, several people who were packing up said they’d go anywhere but the shelter. A man who lived in Las Vegas before coming to Utah 11 years ago — and who declined to give his name while he pumped the brakes on a mountain bike pulling a trailer filled with his things — said he’d try to sleep in a motel room for the night. He wants to find an apartment, get his own place like the one he had before becoming homeless. “I don’t feel comfortable there at all,” she said. The conditions and behavior within the shelter have become a focal point in recent months while state and local agencies work to improve homeless services. By state law, The Road Home is scheduled to close by July 1, 2019, when three new shelters open up in Salt Lake City and South Salt Lake. A recent audit found evidence of frequent drug use at the three facilities run by The Road Home, a nonprofit entity that’s applied to run one of the three new shelters. The audit found people who prefer sleeping elsewhere, fearing a stay at the shelter would send them back into the thrall of drug addiction or that they’d lose belongings to thieves. The audit has sparked an attempt by those involved in homeless services to figure out how shelter staff should respond to various levels of misconduct by residents. It’s also led some to question: If people are kicked out of the shelters for violating rules against drug use, where will they end up? But the cleanup also highlighted another question: If rules banning drug use or other misbehavior aren’t strictly enforced, how many people will choose to avoid the shelter and stay outside? This wasn’t the first time a series of homeless camps have been cleared in Salt Lake County. There are regular cleanups downtown and along the Jordan River. Crews had already been to the Victory Road camp area. It probably won’t be the last time. “There’s always people on the mountain,” said Sullivan before crossing west over Victory Road and hopping over a concrete barrier. “There will still be people on the mountain.